This weekend we took care of stuff around the house, which was very awesome. On Saturday afternoon, we went and visited a mama from one of my DDCs (due date clubs) and spent time with her kiddos. It was really cool to be around a baby the same age as Cecilia and see what they had in common and what they did differently, developmentally. R, the other baby, is totally chill when he's lying on his back, just observing the world. Cece, on the other hand, is as hyper as she is the rest of the time. R stands really well with just his mom supporting his torso. Cecilia is reaching for and grabbing toys-- thankfully, she didn't grab any of R's from him! But that was definitely a blast, and we will have to do it more often! I've also started a little side project this weekend. I am making baby hair accessories. I have made a few headbands for Cecilia and feel like with a little more practice, I will feel comfortable making them for other people, and possibly for selling! Wouldn't that be something else! I crochet the headbands and then separately crochet a little five petaled flower and attach it to the headband. Down the line I want to start attaching the flowers to clippies instead so they can be switched out with ease. I will show you how I made it if you want! 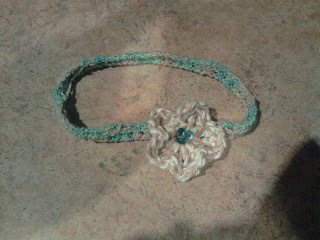 I used skinny stretchy yarn for the headband and a very small hook, and regular yarn for the flower.